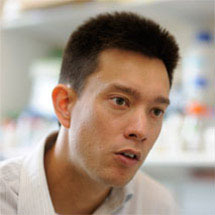 Jason Chin, from the LMB’s Protein and Nucleic Acid Chemistry Division, has been inducted into the European Inventor Hall of Fame, at a ceremony in Munich on 17 October 2013. The European Inventor Hall of Fame is a travelling exhibition that honours outstanding innovation and creativity, and has been commissioned by the European Patent Office to celebrate 40 years of the European Patent Convention. Jason is one of just seven innovators chosen for this recognition from the finalists and winners of the European Inventor Award. Jason has been chosen for his work in the field of synthetic biology – re-engineering protein synthesis by incorporating unnatural amino acids into proteins, which enabled scientists to understand and control the function of proteins in cells with unparalleled precision and to produce new proteins. This achievement changed the universal belief that some components in a cell, such as the ribosome, are un-evolvable as they are essential for the cell to work. This invention has the potential to revolutionise the way patients are treated in protein-like therapeutics, such as insulin treatment, as well as to detect prostate, ovarian, and colon cancer. The exhibition can be seen at the Deutsches Museum in Munich until the end of January 2014, when it then moves to some of Europe’s other leading science and technology museums. Following the induction in Munich, Jason gave a Solvay Public Lecture for the International Solvay Institutes in Brussels on 20 October 2013. Each year the Institutes organize a prestigious public event, where scientists have the opportunity to lecture on topical scientific subjects. The title of Jason’s lecture was ‘Reprogramming the genetic code’.